Should I breed my GSD? Enjoy this resource? Donate a little to help keep the website going! Thank you for your support, it is an honor to provide this to the community. Welcome to the German Shepherd Dog Guide! The German Shepherd Dog Guide is a website dedicated to providing accurate information and resources to the community while raising breed awareness and educating the public on all things German Shepherd Dog. This website acts as a resource for German Shepherd Dog owners, enthusiasts, breeders, trainers, animal care professionals, new owners, and potential new owners. You will find lots of information in regards to the breed standards, temperament, and physical appearance. You will also learn about dog sports, jobs, and recreation with the German Shepherd. There is a section for informative articles, information on how to select a reputable breeder, and a breeder directory which contains a list of breeders with proven, respected breeding programs to help new puppy buyers get started on finding the right breeder for their family. Special thanks to the German Shepherd Guide "Quality Control" Team! The following members of the global German Shepherd dog community have reviewed the content of this guide to help ensure accuracy and quality of information. 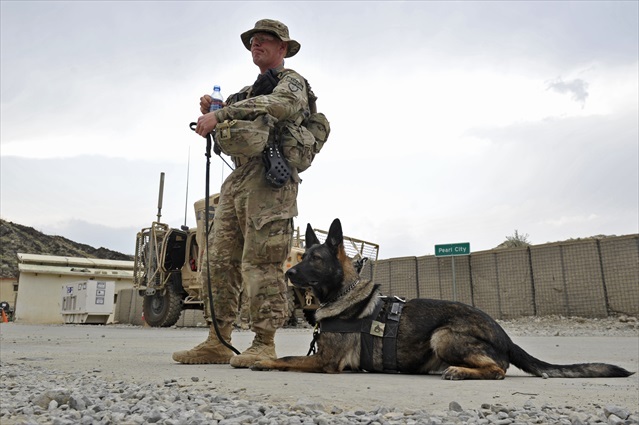 Photo by David Winners and his military K9 Fama!